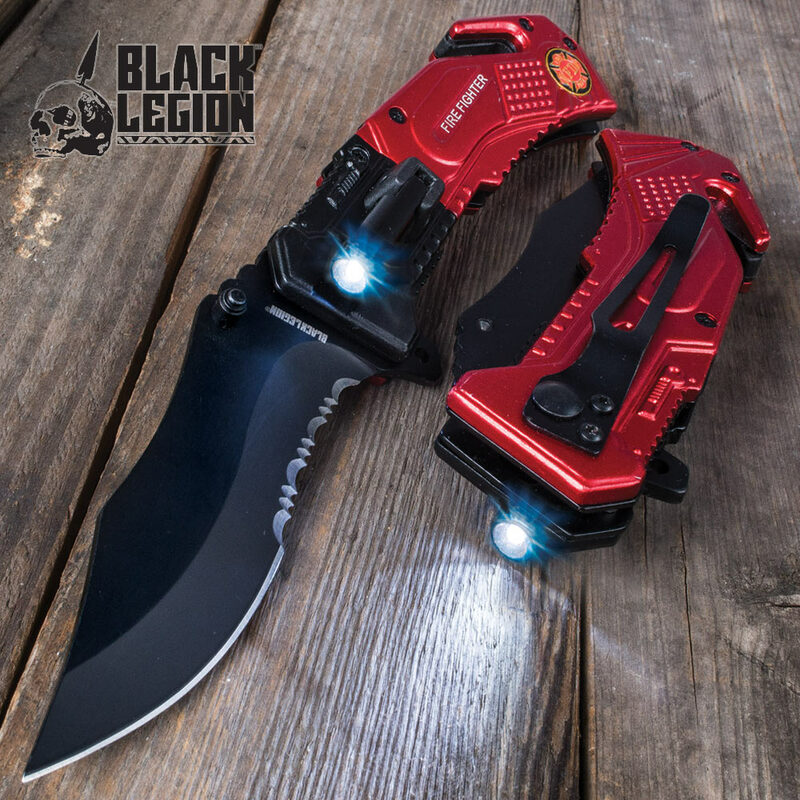 Light your way through the darkness, just like a brave firefighter, with Black Legion's versatile Firefighter Everyday Carry Pocket Knife, which features a handy built-in LED flashlight! Boasting a black 3 1/2" 420 stainless steel blade with partial serrations, this tough folder can tackle practically any day-to-day cutting job and then some. Like a firetruck speeding towards the scene of a fire or accident, the modified clip point blade opens with impressive speed, thanks to the smooth assisted opening mechanism. Just nudge the convenient flipper or thumbstud and watch the blade fly open! The handsome red and black handle is forged with durable, corrosion-resistant aluminum and features a classic fire department medallion and "Firefighter" etched in white, all-capital lettering. At 5" closed, the Firefighter Everyday Carry Pocket Knife fits comfortably in jeans pockets, especially with the included black aluminum pocket clip. Faithful to its moniker, this knife is a perfect "everyday carry" built strong to withstand the daily grind. It could even save your life in an emergency! The integrated seatbelt cutter and glass breaker allow you to escape or help others escape entrapment in a vehicle or building, and the small-but-bright built-in LED flashlight is perfect for "escaping" the dark. The flashlight is mounted on a sturdy hinge and swings out 90 degrees for multi-directional illumination. 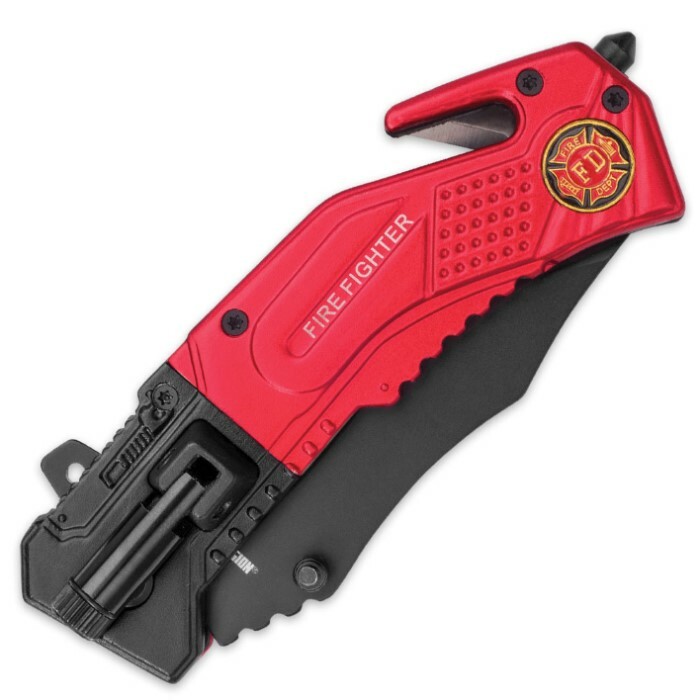 Black Legion's Firefighter Everyday Carry Pocket Knife makes a heartfelt, memorable gift for a firefighter in your life. It’s also a great way for civilians to show their solidarity and support for the brave men and women who risk their lives to keep the public safe in calamitous times. You won't find a better knife at this price anywhere else, so don't wait. Order today! Bought it for a friend whose a volunteer Fireman and he loves it. It's well made and the flashlight is an added bonus. My edc broke and I needed a replacement. This one feels good in the hand. I thought at first the flashlight would get in the way but it doesn't. Both left and right hand neatly fit around it. Great knife for the price. This knife has become my go-to for everyday carry. I wasn’t expecting much out of the flashlight, but was very surprised with how bright it is and the batteries still haven’t died, even after extended use. The fact that the flashlight pivots is a cool feature because if you need a hands free light, you can use the pocket-clip to clip the knife to your breast pocket(if your shirt has one, you could probably clip it to your collar as well). If you want a reliable, inexpensive knife, I highly recommend this one.